Air Transport Auxiliary’s headquarters was at White Waltham airfield near Maidenhead from February 1940 until 30th November 1945. White Waltham is still the spiritual home of Air Transport Auxiliary (ATA), which was a civilian organization which made an enormous contribution to victory by taking over from service pilots the task of ferrying RAF and RN warplanes between factories, maintenance units and front-line squadrons. During the war, over 1250 men and women from 25 countries ferried a total of 309,000 aircraft of 147 different types, without radios, with no instrument flying instruction and at the mercy of the British weather. Often they were presented with a type of plane they had never seen before. Just 10 minutes drive from White Waltham in the centre of Maidenhead you will find the ONLY exhibition and archive in the world dedicated solely to ATA. Our exhibition has been described as ‘inspiring’ and our archive as a ‘goldmine’ and they are complemented by our fabulous Spitfire simulator experience. The idea of using civilian pilots as a kind of Territorial Air Force was put forward in 1938, when the Civil Air Guard was formed to offer subsidized flying training to people up to 50 years old. There were also many pilots who had learned to fly in the 1920’s and 1930’s who were either too old or unfit for RAF service but wanted to use their flying skills in some way in the impending conflict. Air Transport Auxiliary came into being in September 1939 as an adjunct of the airline BOAC. Initially it was envisaged that the pilots would fly light aircraft to transport mail, dispatches, medical supplies, etc. But within six months ATA started to take over from service pilots the ferrying of trainer aircraft, then fighters, bombers and even flying boats from factories and stores to front-line squadrons. This contributed to the war effort by releasing fully-trained RAF and RN pilots for combat duties. 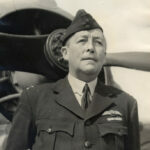 ATA expanded rapidly and credit for turning it into a well-oiled machine goes to its Commanding Officer, Gerard d’Erlanger, a private pilot who was a director of the pre-war British Airways. He joked that ATA stood for “Ancient and Tattered Airmen”. The first recruits, though widely experienced, were either too old or unfit for active service, some having served in World War I. There was even a retired admiral, and Charles Dutton and Stewart Keith-Jopp both had only one arm: this handicap did not stop them flying aircraft such as the Spitfire and the Typhoon. The first 8 women joined ATA on New Year’s Day 1940, recruited into this man’s world by Pauline Gower, who had made a living giving joy rides. 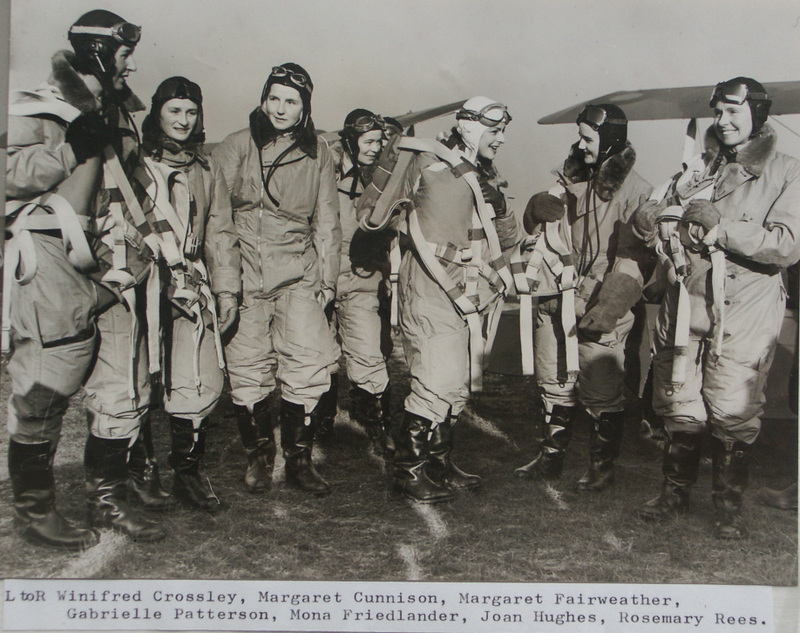 Despite their experience, the women were restricted to flying non-operational types of plane, such as trainers or communications aircraft. They were also paid 20% less than the men, which was typical of the times. 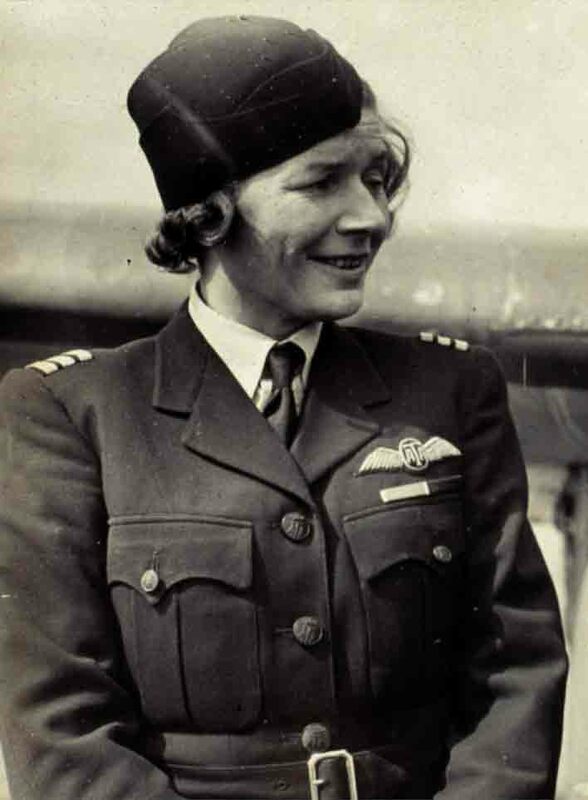 With quiet persistence, Pauline Gower (below) eventually won equal flying opportunities for her ladies. On 19 July 1941 Winnie Crossley was the first woman to be checked out on a Hurricane fighter, and from then on the sky was the limit. 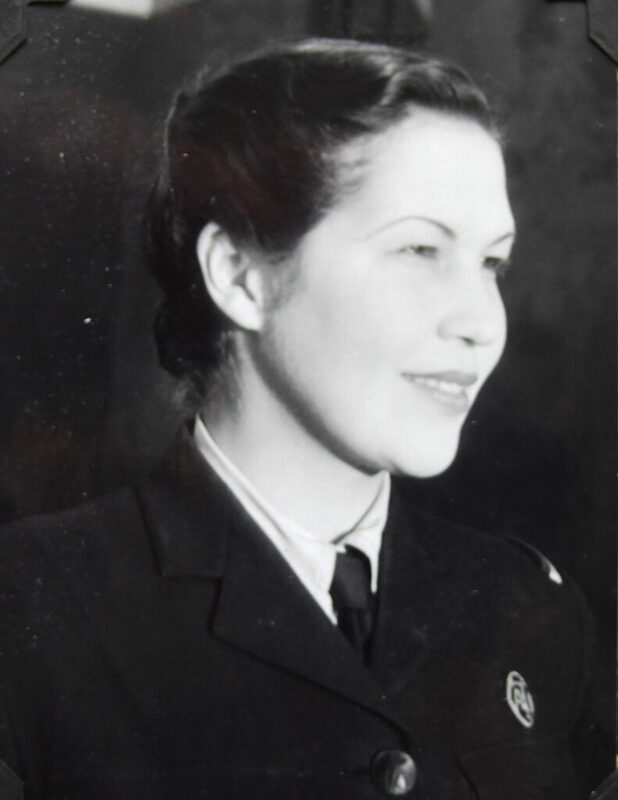 In autumn 1942 First Officer Lettice Curtis became the first woman to fly a 4-engined bomber, an achievement shared by just 11 ATA women. Finally in 1943, the women were awarded equal pay to their male colleagues, making ATA one of the first Equal Opportunities Employers. During the war ATA employed 168 women, including the famous trail-blazing pilot Amy Johnson (killed in January 1941) and a large contingent from the USA, who were recruited by the famous American pilot Jacqueline Cochrane. The female pilots became known at the “ATA-girls”; flying Spitfires was an amazing thing for women to do, and so they were given a great deal of publicity, to the chagrin of some of the men! Men and women came from all over the world to join ATA. Eventually, 25 nations were represented, including Canada, Australia, New Zealand, South Africa and the USA. There were pilots from Chile, Russia and India. There was even a royal prince from Siam. The largest contingent from Europe were 17 Poles, including three women who reached Britain after escaping via the Balkans and France. Flight Captain Klemens Dlugaszewski had years of experience with LOT Polish Airlines and had such an unpronounceable name that he was known as “Captain Double Whisky”. Margot Duhalde from Chile, know to all as Chile. She died in 2018. Flight engineers were required for ferrying 4-engined bombers, Catalina and Sunderland flying boats and Douglas Dakotas. Sir Freddie Laker, the buccaneering pioneer of cheap air travel (remember SKYTRAIN? ), was an ATA flight engineer based at White Waltham. John Gulson was awarded the George Medal for his part in the rescue of the crew of a Halifax bomber which crashed into the railway cutting at White Waltham in July 1944, with live bombs on board. 4 women served as Flight Engineers with ATA. Pilots were based at 14 Ferry Pools as far apart as Hamble, between Southampton and Portsmouth, and Lossiemouth near Inverness in Scotland. Two of these Ferry Pools (Hamble and Cosford) had only women pilots, with female Commanding Officers, Margot Gore at Hamble and Marion Wilberforce at Cosford. Several were near aircraft factories which were priority targets for the Luftwaffe. The peak monthly output from the Spitfire factory at Castle Bromwich was 320 machines, so it was necessary to move aircraft away to relative safety as soon as they came off the production line. The nearest factories to No.1 Ferry Pool at White Waltham were at Brooklands (Vickers-Armstrong), Langley (Hawker) and Woodley (Miles). Central Ferry Control, part of 41 Group RAF, was at Andover. Overnight they would allocate work to the Ferry Pools, where Operations Officers were faced with a logistical nightmare, allocating work to aircrew depending on their qualification and experience. A day’s work could involve several flights in several different types of plane. Aircraft taxis, the Avro Anson and the Fairchild Argus, conveyed pilots to their first ferry job and, if possible, collected them at the end of the day. If not, pilots would stay overnight at airfields, in hotels or take a night train back to base; the diary of one American pilot held at Maidenhead Heritage Centre shows that he got fed up with British trains. There could also be much sitting around waiting for the British weather to improve, especially in winter. At White Waltham, home to No. 1 Ferry Pool, the spire of Shottesbrooke Church, one mile away on the other side of the airfield, was a good measure of visibility. Depending on their level of experience and training, ATA pilots could be called on to fly any one of 147 different aircraft types from anywhere to anywhere. Yet often they had never seen a particular aircraft type before. Pilots Notes were issued for individual aircraft types, but the main guidance was a thin volume of Ferry Pilots Notes – a pocket-sized flip pad of basic do-and-don’t for every aircraft in service. Log books at Maidenhead Heritage Centre show the variety of types which an ATA pilot could fly in a single day. Pilots were allocated a classification according to the types of aircraft they had been cleared to fly. ATA had its own flying schools at Thame, for initial flying training, and White Waltham for advanced flying training. Air Transport Auxiliary’s male pilots had delivered fighters to France in 1940. Four years later, in the run-up to D-Day in June 1944, White Waltham and Aston Down were designated as ATA’s Invasion Pools, delivering fighters to front-line squadrons. The Air Movements Flight flew Ansons throughout western and southern Europe and the Mediterranean, carrying personnel and cargo, including spare parts and medicines. ATA was much more than just its ferry pilots, who formed around one third of the workforce. There were flying instructors, ground school instructors, ground engineers, crash rescue teams, met. officers, motor transport drivers, nurses and doctors, administration staff and so on; there were even Air Cadets and Sea Cadets employed as messengers and auxiliary crew members. In total 173 ATA aircrew died in ATA service, including Amy Johnson. They are commemorated on a special memorial in St Paul’s Cathedral, London. Poor weather, mechanical failure or accidents in training were the principle causes. The largest group of ATA graves is at All Saints’ cemetery in Maidenhead, where 17 war graves represent men and women 6 different nationalities. Click here for full details of ATA fatalities. There are memorials to ATA at various airfields including White Waltham, Ringway, Ratcliffe, Whitchurch and Hamble. However official British government recognition did not come until September 2008 when all surviving veterans were awarded a special Veterans Badge at a ceremony at 10, Downing Street, London.